Will Any of Them Beat Trump? It’s only just the first full week of 2018, and already, presidential campaigns have already gotten underway. As it is going to be my first presidential election that I’ll finally be allowed to vote in, I’m honestly filled with a variety of emotions that I don’t really know what to think. Trump will win unless the economy tanks or he is indicted and charged by the Mueller investigation. I’ve gone through every single possible candidate I could think of and none seem solid enough, whether with a base or support from the whole Democratic Party. And that’s really the crux of the issue for the left in my eyes. Yes, both sides of the aisle have a range of ideas and perspectives. However, what I think the Republican Party did so effectively was that they set most of those opinions aside to support Trump (who knows how that will taint political reputations if the presidency goes south). What do you see when you look at the Democratic Party? A party split at their base, with half being a part of the old guard (Schumer, Pelosi, etc), and the other half that is far more progressive (Sanders, AOC, etc). I’m not saying one side is better than the other, which I don’t even really know. But the problem is that the old guard is doing too much to quell the younger, lefter-leaning part of the party that it is hurting the party as a whole. That kind of fragmentation, whether disputes about the lack of procedure by younger candidates, to their use of less formal language, is and never will be conducive to party unity. They said we weren’t ready for a black president when Obama ran, and he won. And what did we end up with now? A complete, polar opposite of everything he stood for. Do I think that will happen again? Honestly, absolutely not. If anything, President Trump stirred up a base that had never really been interested in electoral politics on a national level. Those voters are here to stay, engaged and focused for this 2020 campaign. The rallies he’s thrown across the country are unofficial pitstops to ensure his base is still focused on ensuring he’s a two-term president. A polar opposite, at least with everything we know now, most likely will not be possible. What does that mean? That means, unfortunately, I’m not as confident that a woman or a person of color would win as I was in 2016. That by all means that I won’t vote for a POC or woman candidate that aligns with what I believe in; it means that the odds to surmount the white supremacist, sexist DNA of this country are low. You can say you believe and demonstrate that you believe in policy, which is the right way to run a campaign. However, some in this country, at least as of right now, do not appear to be able to look beyond race or gender. So much of the Trump base is feeling the consequences of how own actions. I don’t have to list the billions of dollars that the nation’s economy loses from this shutdown or the thousands of federal employees that don’t have their paychecks. Likewise, I don’t have to mention the waste of money we would be spending on a wall when illegal border crossings are at one of its lowest in history. But I will say this: they will somehow stick it out and ride for their president, which just goes to show you how much dedication they have for Trump. This is why Democrats most likely will lose again in 2020. 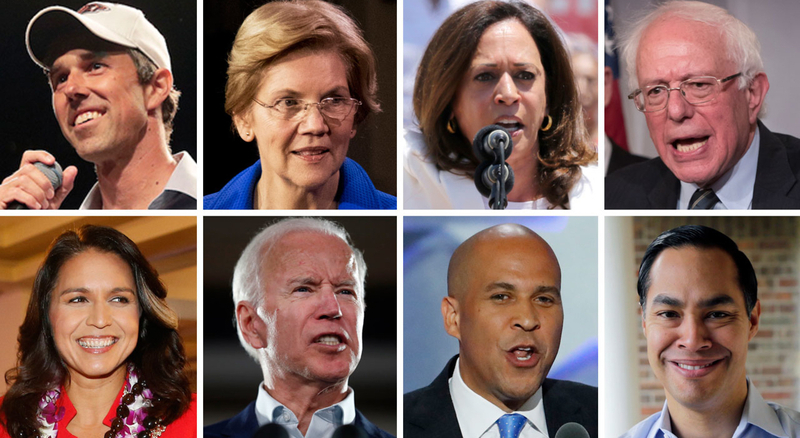 As far as candidates that have announced, from Warren, Gabbard, Castro, and the others who are poised to run (Biden, Gillibrand Bernie, O’Rourke, Booker), I have no clue who will come out on top just yet. Warren all but lost my vote with the DNA test, but I am staying open to hearing everyone on the campaign trail to really figure this out. After all, with a year and a half till primaries here in California, I’ll continue to keep my eyes tuned in and focused as I hope we don’t get another four years of Trump. Being Noah Tesfaye #63: Will Any of Them Beat Trump? Next PostNext I Can Finally Vote!